Baked potatoes are one of my favourite comfort foods. Perfect to pair up with a Belgian beer adn plenty of condiments. Heat up the oven to 200-225 degrees C.
Clean the potato and prick deep with a fork or a thin needle. 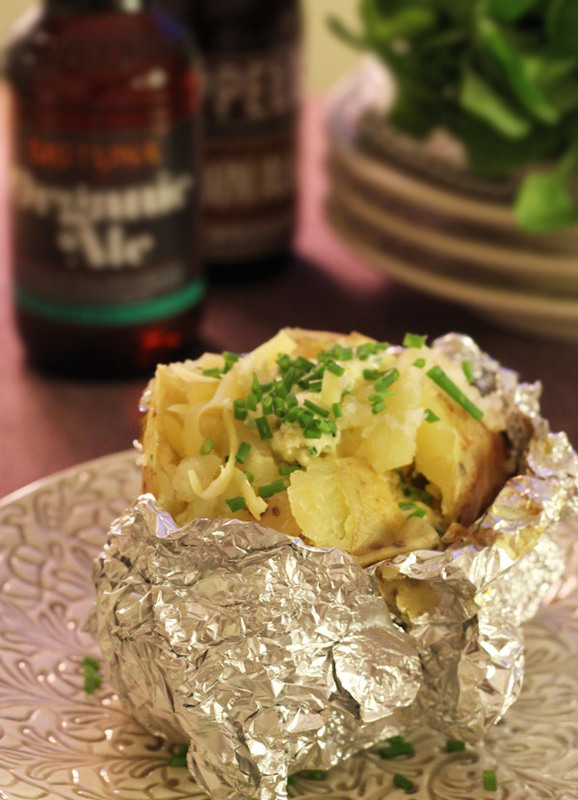 Wrap the potato in tinfoil and place in the hot oven. Bake for 1-2 hours depending on the size of the potato. Serve immediately with the desired condiments. Once baked I usually slice a cross in the potato. Give it a gentle squeeze from the long side so the middle pops up. Gently remove some of the top of the potato, add vegan cheese add some potato back on top, then add vegan butter. Top with more potato, then add more vegan butter and sprinkle some vegan cheese on top as a finish. During devouring the potato I have the vegan butter, creme fraiche and vegan cheese at hand so I can top up when needed. I love when the potato, butter and vegan cheese melts into a gooey mash. Serve with a nice beer of choice.